Can I Plant My Gardenia Bush in Full Shade? Gardenia flowers possess a distinct, sweet, heavy scent used to provide fragrance to perfumes, candles and scented oils. The flower is fragile and will quickly brown and bruise if roughly handled. Keeping the cut gardenia flower fresh for a longer period will begin when it is removed from the gardenia bush. Choosing to leave gardenia flowers on the bush and proper handling can keep them looking fresh longer. Wipe the blades of gardening shears with rubbing alcohol to sanitize them before cutting or pruning the gardenia bush. Hold the flower by the stem when cutting flowers from the bush as oils from your hands will cause the petals to darken. Keep the flower stems in water to hydrate. Add floral preservative to the water, following the directions on the packets. Place cut gardenia arrangements out of direct sunlight and heat generating appliances. Cooler room temperatures will help the cut flowers last longer. Place a gardenia flower in a plastic container that isn't air tight and store in a refrigerator for up to 24 hours; this makes a nice corsage. Sanitize the blades of a pair of sharp garden shears before deadheading the gardenia blooms. Wipe the blades with rubbing alcohol or a mixture of ten parts water and one part bleach. Always use a clean blade so that bacteria won't be passed to the plant. Inspect the gardenia bush often, and deadhead the gardenia blooms when they begin to wither or turn brown. Hold the gardenia branch with one hand, and with the garden shears in your other hand, make a diagonal cut at a leaf, or where the stem joins to a larger stem. Be careful not to remove buds that may be forming lower on the stem. Pick up any spent blooms that fall to the ground under the gardenia bush, as a build-up of debris will invite disease and pests. Rake up the spent blooms and other debris, and dispose of the debris, or toss it on the compost heap. Keep your gardenia bonsai in a warm, sunny location with temperatures that never fall below 68 degrees Fahrenheit. Choose a indoor location with full, bright sunlight or an outdoor location with partial shade. Bring your outdoor bonsai indoors in fall, just before the temperatures begin to cool. Gardenia bonsais thrive in temperatures between 68 F and 74 F.
Water your gardenia bonsai regularly to maintain an evenly moist, but not saturated, soil environment. Check the soil’s moisture levels daily, especially during the hot summer months. Gardenia bonsai loves moisture, so irrigate just before the soil begins to dry. Be vigilant during the hot, dry summer months as gardenia may require multiple irrigation in one day. Feed this acid-loving bonsai with a fertilizer especially designed for acid-loving plants. Apply the fertilizer applications once a month from late spring through mid-fall, but never while the gardenia is in bloom. Remove the gardenia bonsai’s dead and dying branches and stems during the dormancy period, after the blooms have finished flowering. Use sharp, sterile pruning shears to make flush cuts. Cut back the gardenia’s vigorously growing branches to develop shape. Trim back its vigorously growing branches periodically during the growing season to maintain shape and prevent a leggy appearance. Replenish its soil environment every other year during the early spring, just before the onset of the growing season. Create an acidic loam with a pH that rests between 5.0 and 6.5. Repot the gardenia in the freshly mixed loam without root pruning. Water the gardenia immediately to promote a good establishment. Keep the temperature between 70 and 74 degrees Fahrenheit if you have your gardenia indoors. Lower the temperature by 10 degrees at night. Place gardenia plants in full sun inside and partial shade outdoors. Bring your gardenia inside if the temperature threatens to drop below 60 degrees Fahrenheit. Line the bottom of a tray with small stones, and add water to just below the tops of the stones. Place your gardenia container on the tray to provide extra humidity. Make sure the bottom of the gardenia pot does not come in direct contact with the water. Keep the soil of your gardenia plant moist but not soggy. Never let the soil dry out completely. The buds on the plant will drop in soil that is too wet or too dry, so try to find a happy medium. Apply a fertilizer specially made for acid-loving plants each month from April to November. Always follow the instructions on the fertilizer package. Check your gardenia for bugs regularly, especially if your plant has spent time outdoors. Remove any visible bugs and treat infestations based on the variety of insect. Gardenia is propagated through cuttings, grafted to rootstock for nematode resistance or started from seed. Cape-jasmine grows to a height and spread of 4 to 8 feet. Dwarf cultivars, such as Radicans, reach to 18 inches with a spread of less than 3 feet. Plant gardenia in full sun to partial shade and in rich, well-drained soil. The plant performs best in slightly acidic soil with a pH around 5 or 6. Gardenias survive outside in USDA hardiness zones 8 to 10. Spread a 3-inch layer of mulch around the plant. Remove dead flowers to encourage more buds to form. Prune in spring to maintain shape. Apply fertilizer during the growing season. Water weekly when less than an inch of rain falls. Gardenia thrives with indoor temperatures between 65 and 70 during the day and 10 degrees cooler at night. Water when the top inch of soil dries. Fertilize regularly. Use a humidifier to moisten the air and provide sunshine or a grow-light for at least 6 hours daily. Place your gardenia plants in a south facing window where the sun shines brightest. Place the gardenia plants on moist pebbles and run a humidifier nearby; this will increase humidity, especially in the winter months. Water your gardenia plants whenever the top inch of soil dries. Add a fertilizer made for plants that thrive in acidic conditions, such as azaleas. Check the labels on the fertilizer containers to find the right one. Fertilize between April and November. Remove and destroy all diseased leaves to prevent spreading infection. Sterilize any knives or snips used for cutting with bleach. Use a fungicide on the plant if it gets infected. Follow the instructions on the label. Dig a hole that is as twice the diameter of the gardenia's current container and just as deep. Remove the gardenia bush from its container. Be careful not to damage the plant's roots. Place the gardenia bush in the hole so that the top of its root ball is slightly above--but no more than 1 inch above--ground level. Fill half of the hole with soil. Then fill it with water so that the soil settles. Then finish filling the hole with soil. Do not cover the gardenia bush's root ball with more than 1 inch of soil. Build a 3-inch-high watering berm or dam around the planting hole. Fill the berm with water from a slow-running hose. Check the gardenia bush's soil frequently. Fill the berm whenever the top inch or so of the soil feels dry (at least twice weekly) until the gardenia bush is firmly established and producing new growth. Under ideal conditions, a gardenia can grow in full shade in USDA hardiness zones 8 through 10, but it prospers best in partial shade. If possible, plant it where it receives abundant morning light and afternoon shade. The eastern side of your home is perfect for this. Although a gardenia in full shade will still blossom, its flowers will be smaller and more sparse. If you simply intend to use the gardenia as a screen, then this might not be something to worry about. If, however, you want to get the best blossoms, consider planting it elsewhere. In zones 8 through 10 the gardenia will survive mild winters on its own. Farther north, you will need to carefully monitor the temperature, especially if it's planted in full shade. When temperatures drop below 15 degrees Fahrenheit, cover the plant and keep it covered until temperatures rise again. Larger cultivars are generally more cold-hardy than dwarf or young specimens. Provide bright light but no direct sunlight. 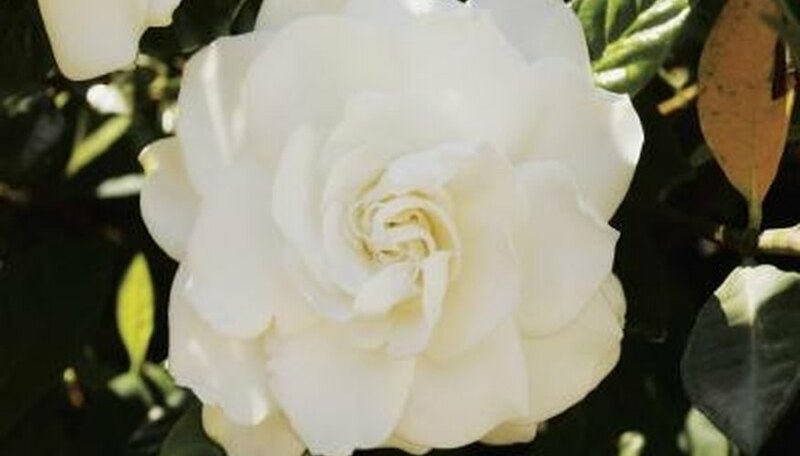 Temperatures need to be kept on the cool side, between 55 and 65 degrees F. At no time should temperatures be allowed to get cooler than 55 degrees F or warmer than 70 degrees F.
Gardenias thrive in an acidic soil, so the potting soil should be amended prior to planting. Mix together equal parts of potting soil, peat moss and sand, moisten it with water and allow it to drain before planting your gardenia. Water the gardenia well and don't let it dry out. Keep the soil very moist. 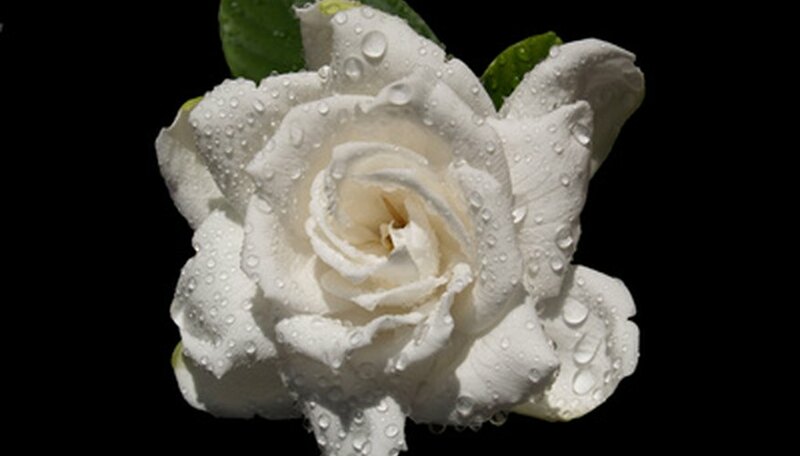 Although gardenias require high humidity, misting with water may cause damage to the leaves. Instead, fill a tray or pan with pebbles and then with water until just the tops of the pebbles are exposed. Place the plant on top of the pebbles. Make sure that the pot doesn't sit in the water. Add more water to the pan as it evaporates making sure to keep the tops of the pebbles exposed. Apply a gardenia or an azalea fertilizer, according to package directions, in March, July and November. Gardenias and azaleas have similar soil pH requirements. Prune your gardenia after it has finished blooming. Make the cut just above a leaf joint. Inspect the gardenia for mealybugs, aphids, spider mites and scale. You can control infestations with neem oil, which is available at nurseries.